When an eminent jurist asks, “What does a copyright of an architectural work truly protect?” you may be certain the question is not rhetorical. The U.S. Copyright Act does provide protection from infringement for architectural works, but it does so in terms so ambiguous that a judge might wonder, as did federal district court judge James Lawrence King in a case he decided earlier this year, whether broadly applicable standards for determining infringement even exist. Finding “the usual analysis … too vague and the language misleading,” King blazed a trail of his own in Sieger Suarez Architectural Partnership v. Arquitectonica International Inc., 2014 U.S. Dist. LEXIS 19140, proposing detailed guideposts for future courts to follow. Sieger Suarez involved two Miami architectural firms and a 43-story condominium tower nearing completion in suburban Sunny Isles. The Sieger Suarez firm was engaged in 2000 by the project’s first owner. When the project, now known as Regalia, changed hands, the new owners dropped Sieger Suarez and engaged Arquitectonica in 2006. This is a scenario made familiar in scores of disputes involving allegations of infringement of architectural works. Befitting a beachfront property with floor-through units starting at $7 million, both designs present dramatic, undulating exteriors. “When facing any of the buildings’ four sides,” King wrote in his opinion, “the façades create the impression of a wave rippling horizontally across the sides of the buildings.” Further, in cross-section, both buildings reveal what King described as a “flower shape,” “a stylized rectangle, with gently rounded corners and an outward bulge more-or-less in the center of each of the four sides.” Should this flower shape, combined with the wavelike exteriors, have been enough to sustain Sieger Suarez’s claim of infringement against its competitor and the property’s owners? Understanding cases of this sort requires an appreciation of two copyright principles: the distinction between ideas and the expression of ideas, on the one hand, and the nature and scope of protectable compilations, on the other. Copyright protects the expression of ideas but not ideas themselves: books but not words or literary conventions (“boy meets girl”), music but not notes or styles, software but not commonplace routines, and architecture but not floors and ceilings, doors and windows, walls and halls. Copyright also protects compilations, that is, aggregations of protectable expression and unprotectable ideas, selected, coordinated and arranged in ways that the result is original even if its constituent parts are not. Think databases. Architectural works are often analogized to compilations, combinations of elements that might not be copyrightable taken in isolation (walls and halls) but achieve a measure of expressive distinctiveness through their inventive combinations. There is no uniformity among federal appeals courts on how to determine the scope of protection for architectural works. District courts are required to conform with precedent established by the controlling court of appeals, in King’s case the Court of Appeals for the Eleventh Circuit headquartered in Atlanta. Lower court judges, such as King, may construe that precedent in innovative ways subject to review by the applicable higher court. These principles are the building blocks with which cases involving architectural works, such as Sieger Suarez, are built. These are the elements that Judge King used to fashion his noteworthy opinion. In January 2006, shortly before being terminated, the firm submitted applications to register its 2003 technical drawings for registration in the Copyright Office. Four months later, possibly in an effort to collect unpaid fees on the Regalia project, it sent its plans and AutoCAD to the project owner. 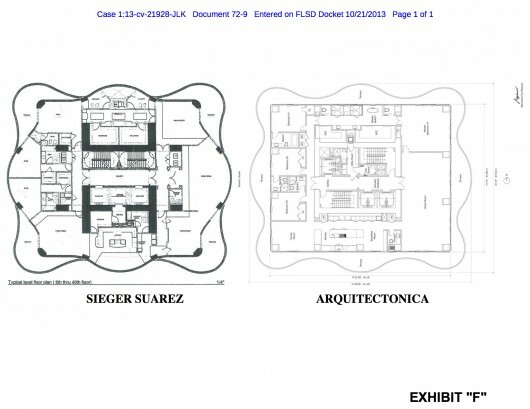 Two months later, on July 20, 2006, in connection with another matter ,Arquitectonica’s attorney sent his client’s plans for Regalia to Sieger Suarez. Five days after that Sieger Suarez submitted applications to register copyrights in additional documents of service it had prepared for the project six years earlier. This confusing chronology notwithstanding, it seems plain the Arquitectonica had access to Sieger Suarez’s plans and could have copied them, and Sieger Suarez had notice of Arquitectonica’s allegedly infringing drawings and could have filed suit based on its registered copyrights. It did not sue, however, for seven more years, until construction of Regalia was under way. To prevail on a claim of copyright infringement, the plaintiff must show that it owns a valid copyright in a work and the defendant copied protectable elements of the registered work. As here, where there is no direct proof of copying, no smoking guns or homemade videos, a plaintiff may establish copying by demonstrating that the defendant had access to the plaintiff’s work, which was undisputed, and that the plaintiff’s and defendant’s works are substantially similar. King’s job? Determine the presence or absence of substantial similarity between the parties’ designs. Spoiler alert: he found none. In the course of deciding the issue, King confronted the undulating, wavelike legal uncertainty that caused him to ask what copyright in an architectural works truly protects. If, as the law recites, an architectural work includes “the overall form as well as the arrangement and composition of spaces and elements in the design” but excludes “individual standard features”; if that overall form is a compilation of protectable expressions and unprotectable ideas; if compilations are, as some courts have concluded, eligible for only “thin” protection”—“baby” protection, King called it—what can be compared in order to determine infringement? [T]he “average observer” referred to by the cases is not average at all. The law in this area … is complex and the distinction between expression and idea can be a difficult one. As such, an “average” observer is one who is fully aware of the law, trained to understand the elements of infringement and protectable features, with knowledge of architectural designs, and with experience to decide the facts of a given case. Such a person is neither average nor ordinary. Following precedent, he insisted, “As the Eleventh Circuit has noted, ‘The substantial similarity required for infringement . . . must be substantial similarity of expression, not substantial similarity of ideas.’” And expression, remember, may include entire compilations. King then enunciated his way, a new way, of determining where to look for similarities. Rather than simply continue down the oft-misleading road of ad hoc analysis, [this] Court will consider certain telling factors of substantial similarity and suggests that this non-exclusive and non-exhaustive list of guideposts should be used by future courts as guideposts for determining the level of similarity between architectural works…. King’s guideposts are four in number: (1) the manner by which a design is achieved; (2) use of ornamental structures and details; (3) how an individual interacts with the space; and (4) location. Turning first to the façades of the Sieger-Suarez and Arquitectonica designs, and specifically to the wavelike illusion, King noted that the defendant’s design is achieved by the addition of wrap-around, irregularly-shaped balconies to an otherwise rectangular-shaped building. These irregularly-shaped balconies combine, floor-by-floor, to create the impression of an oscillating wave running the entire height of the building. Starting from the first balconied floor, Defendant’s oscillating wave is achieved by shifting the center bulge of each successive floor’s balcony just slightly to the side of the balcony beneath it. These staggered balconies and the changing placement of the center bulges results in a dynamic wave across the façade of Defendant’s building. Plaintiff, on the other hand, achieves the outward appearance in a strikingly different manner. Plaintiff’s design is created by the addition of rounded corner balconies to an otherwise irregularly-shaped building with sharply rounded corners and an outward bulge at the center of each of its four sides. Thus, the flower shape of the building is created by structural elements and bay windows that are integral to the design’s floor plans, to which rounded corner balconies are added to complete the flower shape. The bulging bay windows and rounded corner balconies appear in the same place on every floor and combine to create a smooth, static wave that runs the height of the building. While other judges, sitting in other courts, might look at the parties’ respective designs and attempt an aesthetic resolution to the similarity comparison, King boldly looked past the similarities apparent on the surface and asked what lies underneath, what structural imperatives brought each designer to its expression of the flower shape as it rose from ground to sky. To find substantial similarity between the two designs in this case would require a finding that Plaintiff owns a copyright in a concept, i.e. this flower shape, something the Eleventh Circuit has consistently rejected. The shape is an idea while the building and terraces combine to create a protectable expression. Defendant’s expression of the flower shape is plainly different and does not infringe upon Plaintiff’s expression. King undertook a similar analysis of the interior floor plans of the competing designs. Sieger Suarez’s expression of the flower design, with bulging sides and rounded bay windows at each corner results in living spaces with few straight lines. Defendant’s use of a rectangular tower—its irregularly shaped terraces notwithstanding—results in rectangular rooms. Not only do the shape and size of the parties’ rooms differ, the ways in which inhabitants are intended to occupy, furnish and make use of those rooms differs as well. King made additional comparisons, but no superficial similarities were sufficient to overcome the conclusion that the buildings showed no substantial similarity. While King did not give equal weight to each of his “guideposts,” the brilliance of his approach is in providing a technique to replace the ad hoc decision making that typically characterizes decisions in this context. It’s a bit like watching Julia Child on television back in the day. What mattered most was not the dish itself but how she taught the viewer the technique. Given copyright’s three-year statute of limitations, Sieger Suarez would have had to have filed suit no later than July 20, 2009, unless it could show damages accruing with respect to continuing cognizable causes of action. Sieger Suarez pled no such causes of action, and King accordingly ruled plaintiff’s claims exhausted. Mitch Tuchman practices copyright law in the Research Triangle Park, North Carolina, office of Womble Carlyle Sandridge & Rice, LLP. Mitch Tuchman. “What Makes a Copy-Cat a Copy-Cat? The Complex Case of Architectural Copyright” 20 Apr 2014. ArchDaily. Accessed 21 Apr 2014.